Planets is a puzzle invented by Oskar van Deventer, and made by Recent Toys, which also manufactures the Crossteaser and Brainstring. 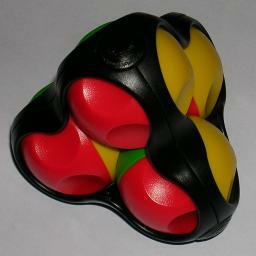 It has four identical balls (i.e. planets) arranged like a tetrahedron so that they all touch each other, held inside a thin frame. The 'planets' have craters in them, and nestle together so tightly that where two planets touch one or the other must have a crater at that spot. If a planet nestles in craters of at least two of the three others, then it can rotate. There are four coloured regions on each planet, and when the puzzle is solved they are all in the same orientation so that each side of the puzzle has a single colour (blue, red, green, and yellow). This is rather hard to calculate for two reasons. First of all, it is not entirely clear what constitutes a position, and second, the irregular arrangement of craters blocks many orientations of the planets. There are only 6 craters on each planet but if we were to add some, extending the arrangement of the existing ones, then a planet would have 12 craters. They are arranged like the vertices of a cuboctahedron. I will only count a planet's orientations where at least two of these 12 points are in contact with the three others planets. A planet cannot have craters at all three contact points. There are 8 ways a planet can have craters at two specified contact points (24 ways for craters at any two contacts). There are 20 ways a planet can have a crater at exactly one specified contact point (60 ways for a single crater at any one contact). There are 12 ways a planet can have no craters at the three contact points. (2,2,2,0): There is only one pattern where three planets have 2 craters, and one planet has none. This pattern can also appear in mirror image. (2,2,1,1): Again there is only one crater pattern, and its mirror image. (2,2,2,1): Here there is one symmetric pattern, and two other patterns with their mirror images. (2,2,2,2): One pattern and its mirror image, as well as another pattern that has mirror and rotational symmetry. Recent Toys is the manufacturer of this puzzle. This puzzle is not terribly hard, but there is one observation that makes it a lot easier. The blue and green faces of a planet have only one crater, while the red and yellow ones have two. It is advantageous to have craters inside the puzzle to give you more freedom to move, so it is best to solve the balls with blue and green faces first. Indeed, the solution below does just that. Turn the planets such that one ball becomes completely free to turn. This is fairly easy to arrange if you keep turning them so that they have two craters touching the other planets. Rotate the loose planet so that it shows blue, green, and red faces. The yellow face is on the inside, which has two craters. This planet is now correct and will not be turned again until possibly the last step. Determine the other planet that is supposed to show blue, green, yellow. Solve this planet next, by turning the other two unsolved planets so that they have a crater facing it. Then the planet is freely rotatable, so make it show the blue, green, yellow on the correct sides. Note that it now has two craters facing the still unsolved balls. Now solve the last planet on the blue side, again by turning the other unsolved planet to get a crater facing it, making the blue planet freely rotatable. This planet is now correct and will not be turned again. 1. Turn the blue/red/yellow planet to the left, bringing a red crater to the contact point. 2. Turn the blue/green/red planet to the left, bringing a yellow crater to the contact point with the unsolved planet. 3. Put the unsolved planet correct by matching the yellow and green faces to the yellow/green/blue planet. 4. Turn the blue/green/red planet to the right, back to its solved position. 5. Turn the blue/red/yellow planet to the right, back to its solved position.